Heat oven to 400°F. Meanwhile, microwave bacon between layers of microwavable paper towels on microwavable plate on High 3 to 4 minutes or just until edges begin to brown but are still soft and pliable. Set aside. In large bowl, mix bread crumbs and milk. Let stand 5 minutes. Add turkey, egg, onion, carrot, bell pepper, garlic, salt and pepper. Stir to combine. Shape into 6 small loaves; place on parchment-lined rimmed baking sheet. In small bowl, beat mustard and brown sugar with whisk. Brush loaves generously with mustard glaze. Arrange 2 pieces of bacon diagonally over top of each loaf. Bake 25 to 30 minutes or until thermometer inserted in center of loaf reads at least 165°F. Let stand 5 minutes before serving. To freeze: Shape mixture into 6 small loaves on parchment-lined baking sheet. Brush with mustard glaze. Arrange 2 pieces of bacon diagonally over top of each loaf. Freeze until firm, about 1 hour. Wrap each meat loaf in plastic wrap; transfer to large resealable freezer plastic bag, and freeze up to 3 months. To bake: Thaw in refrigerator overnight or until completely thawed. Bake as directed. For faster preparation, roughly chop the onion, bell pepper, carrot and garlic, then pulse in a food processor until finely chopped. 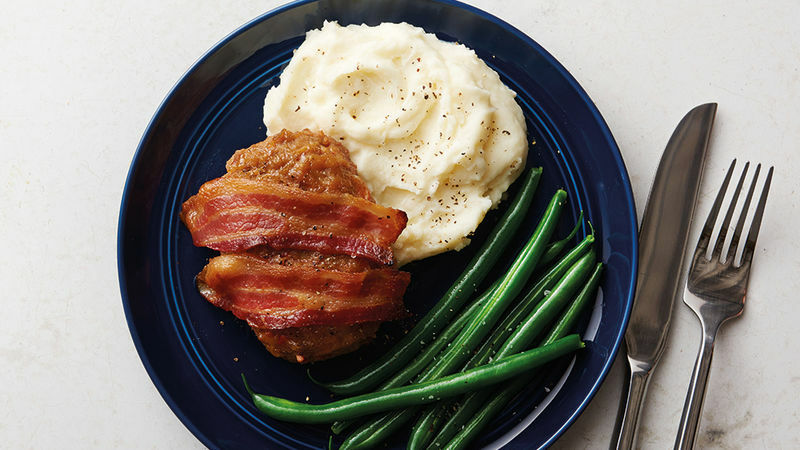 Make sure to use thin-cut bacon to top these meat loaves. Thicker bacon slices won’t crisp up as well in the time it takes for these meat loaves to bake.